Bombarded by comments, the legislator tried to defend himself but later deleted the post. BJP MLA Bachchu Singh at the incident spot. The selfie post was later deleted. 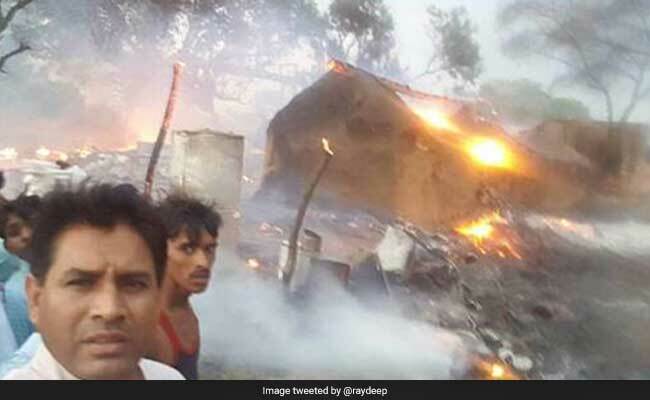 Jaipur: The selfie obsession was apparently taken to a bizarre level by a BJP lawmaker in Rajasthan who posted one taken in front of burning houses. Bachchu Singh was skewered on Facebook after he put up the photo, apparently in an attempt to show his role in tackling a fire in Bharatpur yesterday. Attacked on social media, the legislator claimed that it was not a selfie at all but a way of drawing the attention of state officials to the houses in flames. "It is a matter of perception. I had posted the photo to let administrative officials know that I am on the spot. The SDM (Sub-Divisional Magistrate) concerned was not picking up my call. Then I called up the ADM (Additional District Magistrate) saying that I am at the spot and I am sending you live photographs so that they reach on time and start acting," Mr Singh told the Press Trust of India. "It was not a selfie. Why would I take a selfie of such an unfortunate incident?" asked the politician. Why indeed, wondered many Facebook users and political leaders. Congress leader Sachin Pilot, condemning the act, said, "This is very irresponsible behaviour from the BJP MLA." On Facebook, one person commented, "This is not the time to take a selfie." Another scoffed, "It would have been better if you had poured two buckets of water to douse the fire." When Mr Singh learnt about the fire, he went to the spot and assessed the situation with officials and firemen. He reportedly assured the victims of all necessary help. And then, in a move that baffled many at the spot, he fished out his mobile phone and clicked a selfie in the chaos.